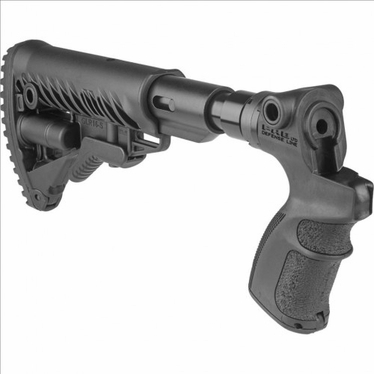 Modular collapsible buttstock and pistol grip system for Mossberg 500/590 shotguns. Features a patented recoil-compensating system for unparalleled recoil reduction! Rugged one piece adapter design features drop-in installation. Correct angle for best recoil control. Textured for secure grip. Storage compartment in grip. Combat proven GLR-16 stock with battery storage and rubber recoil pad, adjustable to five positions. M4 style aluminum buffer tube.